A couple of weekends ago after our lunch at Tomahawk Restaurant, Angela, Anita, Diana, Kathy, and myself, went to Thomas Haas in North Van for dessert. It was very busy inside the tiny store but luckily it was a nice day and they had outdoor seating. Everything at Thomas Haas is tempting so it’s hard to decide what to order. I got the milk chocolate passionfruit cake and coconut mango macaron. The macaron was light and slightly chewy and the mango flavour was prominent. I didn’t taste much of the coconut but it was still yummy. The milk chocolate passionfruit cake was made with layers of almond cake, hazelnut wafer, and passion fruit mousse that was then surrounded by a milk chocolate coating. This is probably the best cake I’ve ever had. 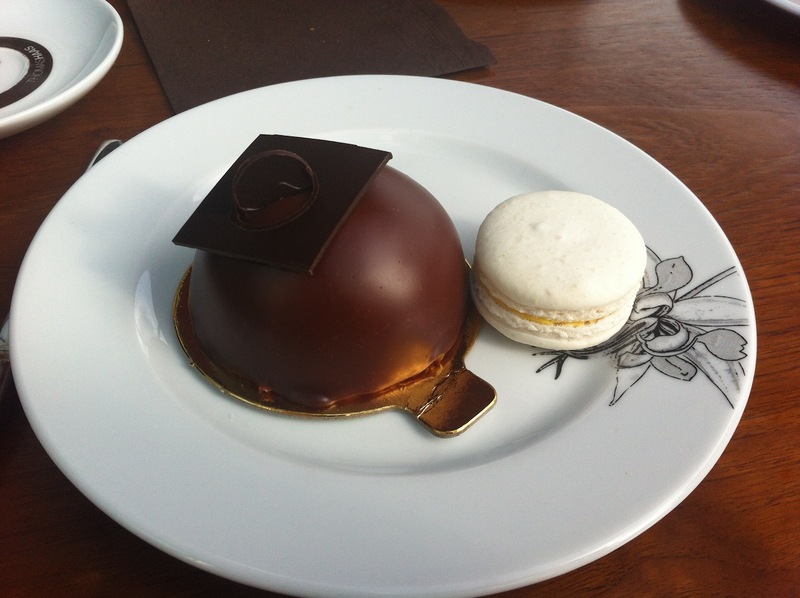 It was creamy and rich from the chocolate with a bit of a sweet fruity taste from the passionfruit mousse. The almond cake inside adds some substance and texture. I would highly recommend this cake to anyone. Angela had the lemon tart which looked beautiful. I had a small bite and enjoyed it. 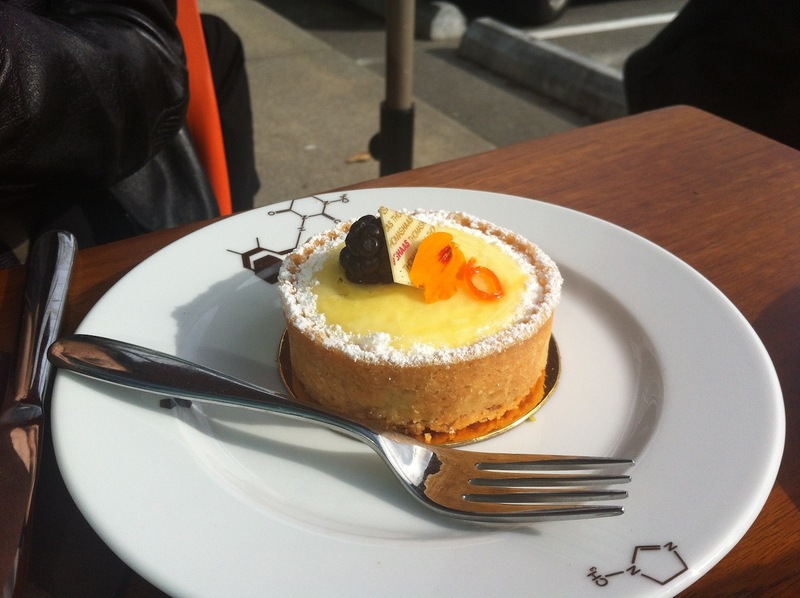 It has a tart but slightly sweet lemon flavour and the crust was crumbly and golden brown. This dessert was good but not quite as epic as the milk chocolate passionfruit. After we all finished our own desserts, we ordered a couple of croissants to share. The first was the plain croissant. This was crispy and flakey on the outside and buttery on the inside. 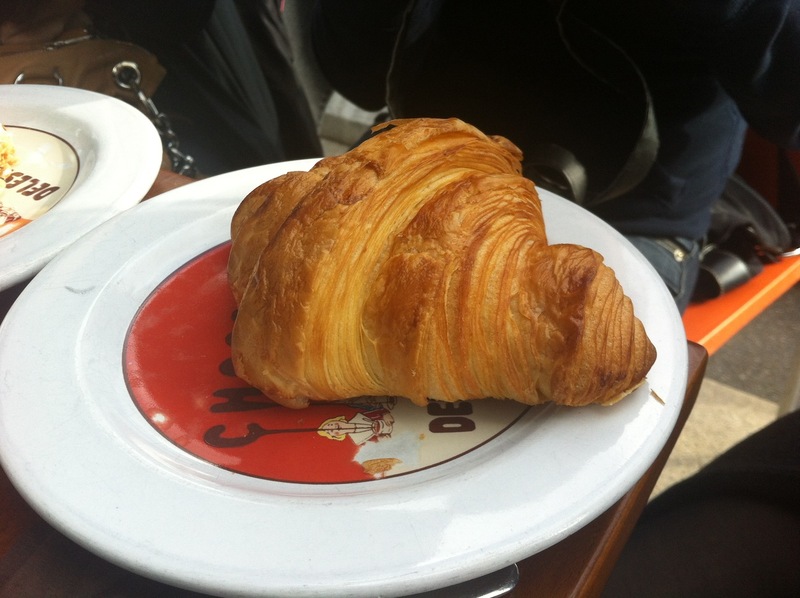 It was also quite large and all around a well executed croissant. The other croissant we ordered was an almond croissant that came fresh out of the oven. Thomas Haas is famous for their almond croissants and now I see why. I wasn’t expecting to be blown away by this but it was simply delicious. 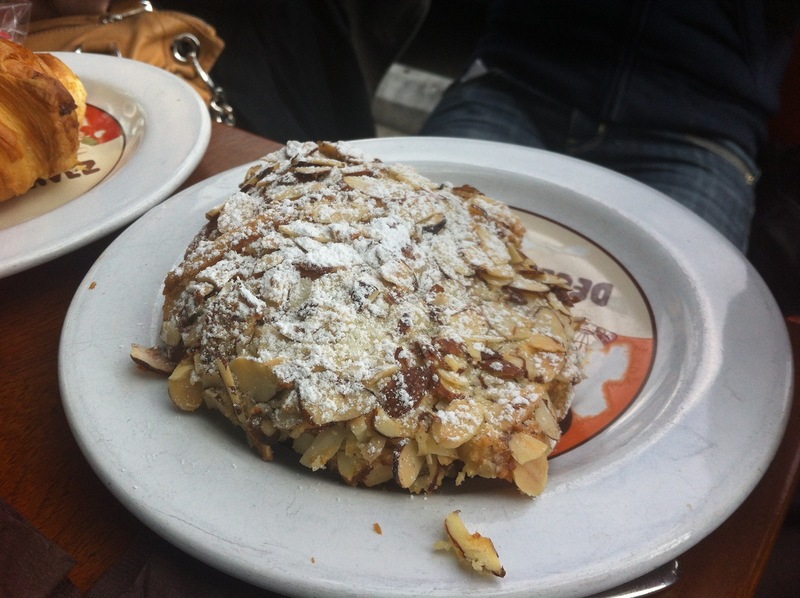 A sweet almond coating covered the whole croissant and it was dusted with powdered sugar. This croissant is very heavy, dense, and sweet, so it’s a good dessert to share. Overall, I was very impressed after my first visit to Thomas Haas. All of the desserts I tasted were high quality and delicious. The desserts aren’t cheap but you really do get what you pay for here and I will definitely be back again next time I’m in the area. Yes, for amazing French inspired desserts.